On a recent weekend at Miami's storied Biltmore Coral Gables - a landmarked luxury resort that, in online promotional materials, boasts of "hand-painted frescos on barrel-vaulted ceilings, brilliant travertine floors, fine marble columns" as well as a Moorish tower, spa, golf course, and 85-foot decorative waterfall - a pack of dogs got together for brunch. The canine diners - a griyo that included a bichon frise, several Yorkshire terriers and some mixed breeds - sat in high chairs at tables with white tablecloths as waiters served them wine. Wine for dogs, that is. "They just lick it all up," Laly Albalate, owner of Doggie Bag Café, a restaurant, boutique and pet party company in Miami tells Newsweek. "It's a delicious libation." Albalate's decision to serve Yappy Hour Vineyard's vintage - a nonalcoholic meat gravy produced by the California company and sold in wine bottles - is part of the recent trend in pet pampering. Adult-themed beverages for animals have been a growing trend in the pet product industry over the past few years. Dogs have gone from playing the part of faithful companion to drinking buddy. Think Sideways meets Beethoven. Tasha Nesbitt, co-owner of Yappy Hour Vineyards along with Michelle Gaylord, told Newsweek that they developed the idea working on Gaylord's other line - gift baskets for dogs. They noticed there were a lot of dog-themed wine products - such as glasses and cocktail napkins with pictures of your favorite breed - but no libations. "We got to thinking: Hey, we like wine ourselves, why not come up with something that can also be good for the dog?" she says. "Our unofficial motto is 'Now you don't have to drink alone.' "
The team tested recipes in their home kitchen, eventually setting upon a chicken-broth based elixir that "was the right consistency, smell and flavor." (Adult-themed beverages for dogs are nonalcoholic, since pets can't consume the chemical - like chocolate, it can poison them.) "It tastes like a chicken gravy that you'd put over your mashed potatoes or your rice." The wine is made in an FDA-approved facility in Florida, that also makes "gravies and hot sauces that you see in the supermarket" for human consumption, she says. The bottles, which retail for $19.99, feature labels reading "Bark-deaux," "Char-dog-nay," "Grrrr-lot," "Pinot Tail-io" and, for feline oenophiles, "Mos-cat-o." They sold 2,000 bottles their first year and plan to expand their offerings, including an organic vegetarian variety. Custom labels, popular at events such as dog nuptials, are also available. Jennifer Brown, who launched Bowser Beer in 2008, is a pioneer in adult-themed dog beverages. She says the success of the concept - a microbrewery in Vancouver now sells a similar grog for dogs and a Japanese sake company sells a variety of sober spirits for pets - stems from their silliness as well as the promise of more animal companionship. "It just resonates with people," says Brown, whose concoction contains a meat broth-base, malt barley and glucosamine. "People like it as a fun, gifty thing. They also like drinking beer with their dogs." 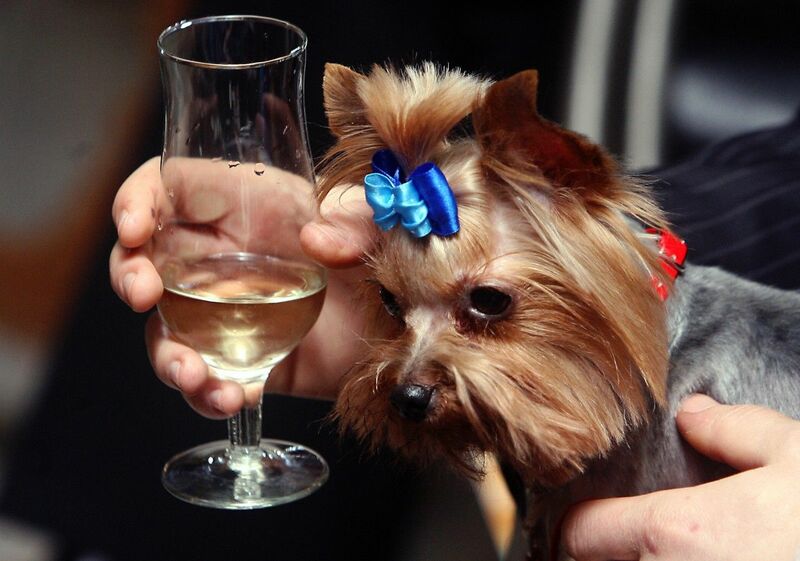 Officials at the American Society for the Prevention of Cruelty to Animals say that this shared activity is okay, so long as dogs act like responsible humans when they imbibe. Labels should be checked for safety, of course, and "just like humans consuming alcoholic beverages, these nonalcoholic beverages for pets should be consumed in light moderation." "They are treats, and should not make up the main part of your pet's daily diet," Dr. Tina Wismer, medical director at the ASPCA Animal Poison Control Center, wrote in an e-mail to Newsweek. "While it may seem nice to share a cool drink with your pet at the end of a long day," she added, "you can probably save the cash by simply giving them a glass of watered down chicken broth. They won't know the difference or care about the lack of fancy bottle!"